I started this blog post intending to list the apps that I use everyday to make my life easier. When I realised that the first three I thought of were all Google apps I figured I should change the theme of the blog post. I think a lot of us now use our phone more and more to make little tasks a lot more efficient. With only a gmail account you instantly have access to a number of services that I have come to rely on more and more. These are my four favourites. 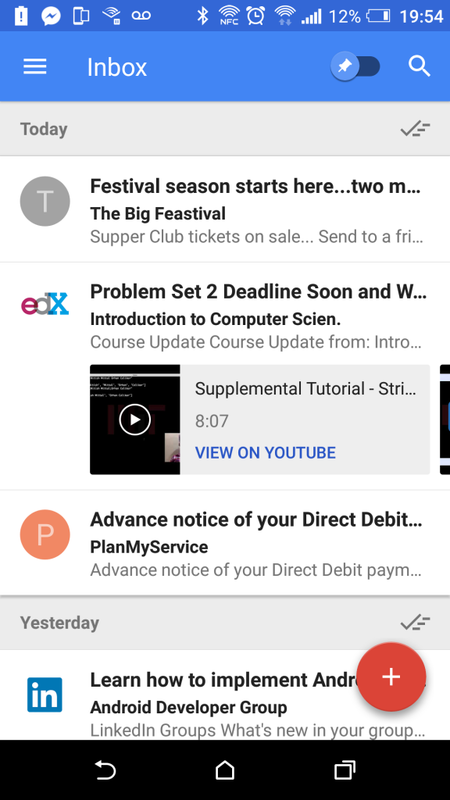 Google Inbox is the follow up to gmail and it has a few nuances that make it a really nice email client. You can reach it in your web browser at inbox.google.com, or download it on the play store. This is a very nice app to use. Simply swipe an email to the right to mark it as “Done” (similar to Archive), or swipe it to the left to snooze the email so that it comes back at a later date. Inbox does some pretty clever things with my emails too; intelligently grouping them into bundles so all emails of a certain type are together (such as receipts) without my intervention. I’m still learning all the little things it does but even at its simplest it’s still a nice email app to use. If you have a gmail account then you already have access to Google Calendar. You can reach it in your web browser at calendar.google.com, and there is also the app on the play store. The reason I like Google Calendar so much is that it ties in with my emails (since I use Google Inbox) so when I get an email confirming a reservation it will appear in my calendar. It also supports reminders (so I can have a recurring reminder to put the bins out) and calendar sharing. Calendar sharing is probably the bit that I like the most. Me and my fiancée both have access to a shared calendar so if something comes up that concerns us both then I can put it in the shared calendar instead of my personal one. 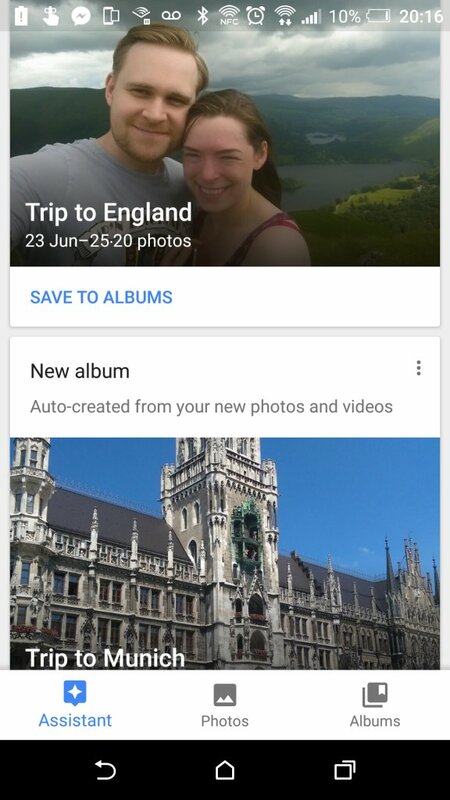 You can reach Google Photos in your web browser at photos.google.com and the app is available in the play store. For the low, low price of having a gmail account you can get unlimited photo and video cloud storage. That is a pretty huge deal. Most people have a fair few gigabytes of photos and videos kicking around. A lot of people have over a hundred gigabytes and are constantly backing up and clearing space on their phones and hard drives. This makes that whole headache obsolete. Obviously if you’re into photography then you will want to keep your photo’s completely untouched at their full resolution, but for the rest of us, with our day to day snaps, what Google offers with Google Photos is just amazing. It will downsize images to 16mp (still big enough to print at a regular size) and videos down to 1080p (which is still HD). On top of that the app will automatically upload new photos to the cloud, sort them all chronologically, create little animations out of similar pictures, put together albums and videos when you go on trips, and even let you search for photos by using image recognition (so you search for “Dog” and it will find all your dog pictures). Google keep is a note and list taking app and can be reached on the web browser at keep.google.com and the app is available on the play store. 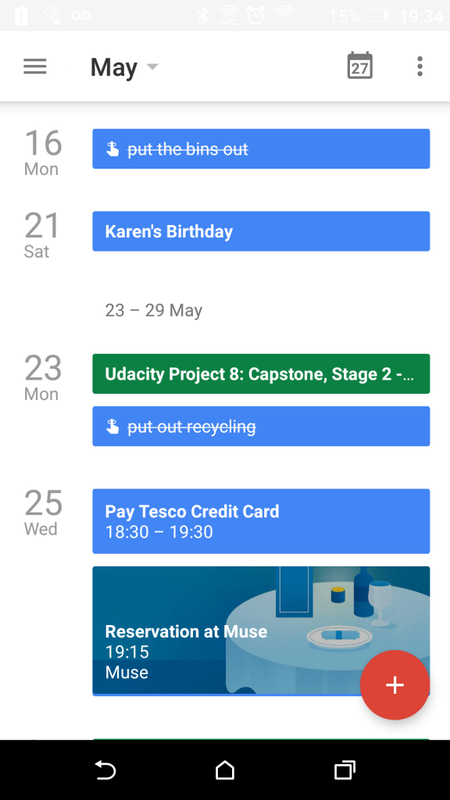 Although I like trello for my more organised kanban board (see my post on dealing with distractions for more on that) I like Google Keep for less structured note taking. 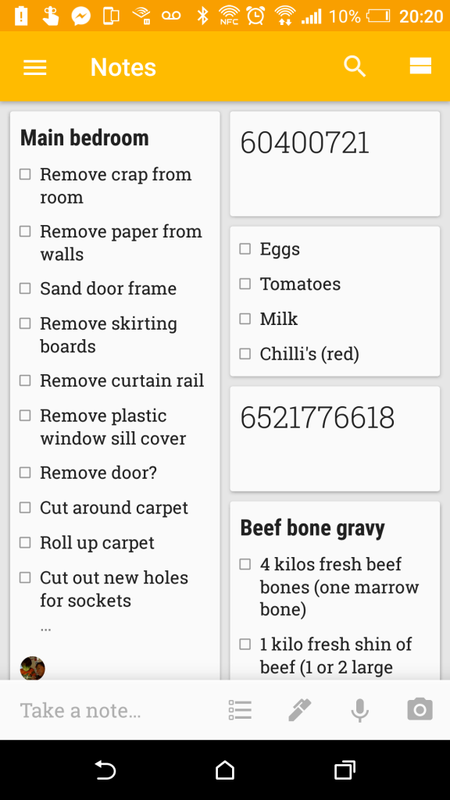 This is the app that I use to write shopping lists and to take down random bits and bobs. One of my favourite bits about it is that it is cloud based so I can share notes and lists with my fiancée and if she or I edit it then the edit is also reflected for the other person. We mainly use this feature with shopping lists so no matter who is at the shop we know we both have the most up to date list to go off, and when one of us ticks something off, it is also ticked off for the other person. Well, there you have it, my top 4 Google services and what I do with them. Please leave a comment if you also use any of these apps to help you in your day to day life, or if you use any different apps that you think do it better than Google. I’d love to hear your thoughts. If I had to come up with the biggest issue I have with completing work in my personal time it would be the continuous effort to deal with distractions. I’m a pretty distractable person. If you could have seen the length of time I took between typing the previous sentence and this one then you would understand my issue. The problem is that I want to be productive and I feel bad if I haven’t been productive, so when I let myself get distracted (by Facebook, Youtube or Reddit for example) I’m basically investing in the bad feelings that are to follow. To try and counter my propensity for procrastination I’ve decided to tackle it from a few sides. I function a lot better with a plan. I like to know what is happening on a given day and when I’ll be doing it or I’m a lot less comfortable. When it comes to work I have the habit of planning the bigger picture but not the breakdown. It forces me to break up bigger tasks into smaller ones. That last point in particular was very useful to me. The pomodoro technique is just a method to encourage complete focus on one task. You set a timer for 25 minutes and do nothing but the single task you are focusing on (no email, no fake attempt at “multitasking” etc). This 25 minute block is a single pomodoro. After a pomodoro you take a 5 minute break. After 4 pomodoro you take 15 minutes. John’s rule was that if you anticipate something will take longer than 3 pomodoro (about 1 and a half hours including breaks) then you need to break it up into smaller tasks. Smaller tasks are a lot more manageable. To take back control from the side of my brain that likes to click the time wasting websites I need to not give myself that option, especially as I get used to the system. I’m going to try out ‘StayFocusd‘ for Chrome and ‘StayOnTask‘ for Android to block or discourage wasting time on unproductive websites during a pomodoro. It would be impossible to just unplug the internet and put my phone in another room as developing without Stack Overflow is a terrifying concept that I don’t want to consider, and I find using my phone instead of an emulator is a lot faster when testing apps. Also, by using the kanban/pomodoro combination I am putting control back into my work by planning what I am going to do and then focusing on it, instead of knowing where I want to be and stumbling blindly towards it. I struggle with incentive because I struggle with distraction. If I work hard I need to ensure I rest, but if I don’t feel like I have gotten enough done (perhaps due to conceding to too many distractions) then I won’t feel like I deserve to do something enjoyable and so I won’t be able to enjoy it. By planning out my work, and knowing when and for how long I will be working, I can hopefully add incentives back in to my life and start enjoying my downtime. I’m going to start now. I planned to write a blog post, I have wrote a blog post, so I’m going to close the PC down and spend the rest of the night with my fiancé.